Here's a classic take on some of the character graphics from the new Dark Shadows movie. Click on the image for a larger view. Oh, nice job! 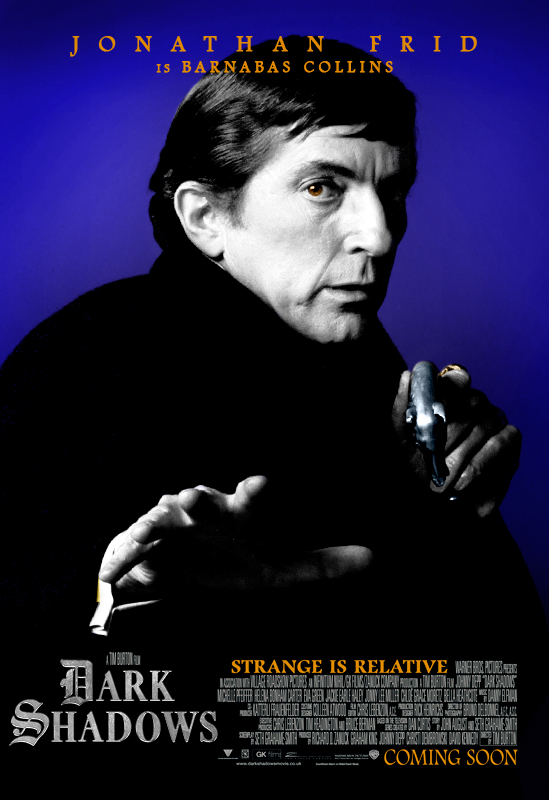 If only our favourite actors, like Jonathan Frid, could stay young forever! This IS fun! Who did this? Will there be more? It was just something I made on a whim... I might do some more yet. With all due respect. The one and only Barnabas Collins, he will reign supreme forever!!! Oh please please please whoever made this awesome pic, do one of Willie with Karlen please! I love it. I wonder when Warner Bros. will release the movies, House of Dark Shadows and Night Of Dark Shadows? I love this! Looks great, and shows that even Frid can stand up to the Burton vibe as good as ever. Stuart...I love this and if you have the time I'd love to see the rest of the original main cast get the same "DS 2012" treatment. Wow! This is REALLY great! Shows what fans are really hungering for--yes, please more from original cast! Just tell us wher we can buy this gorgeous poster! As the title says, it's just for fun – none for sale, I'm afraid. How so very cool & nice the High tech look on such an Iconic character Barnabas Collins/Actor Jonathin Frid. He looks sharp! Would like to see one done of each DS's character being highlighted in the movie. Thanks!